We provide this list knowing that it is impossible to know every hazard that a river can present. It is important that you take the time to study the river and its dynamics and use lists such as these as a reference for the building blocks of hazard recognition. This by no means is an exhaustive list of hazards as it is impossible to know everything we can encounter, especially as our impact on rivers increases. 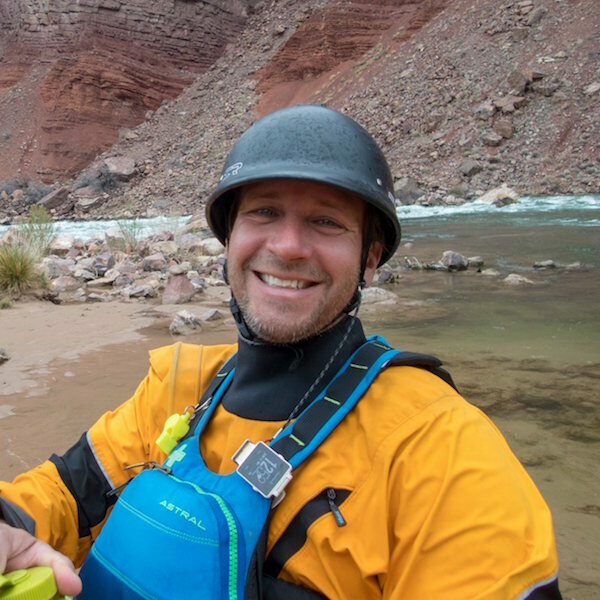 H2o Dreams created this list as an unofficial reference for our students and it is important that each paddler uses judicious decision making when choosing to run rivers. Is there something you don’t see here that you think should be added? Drop us a line here. Want to learn more? 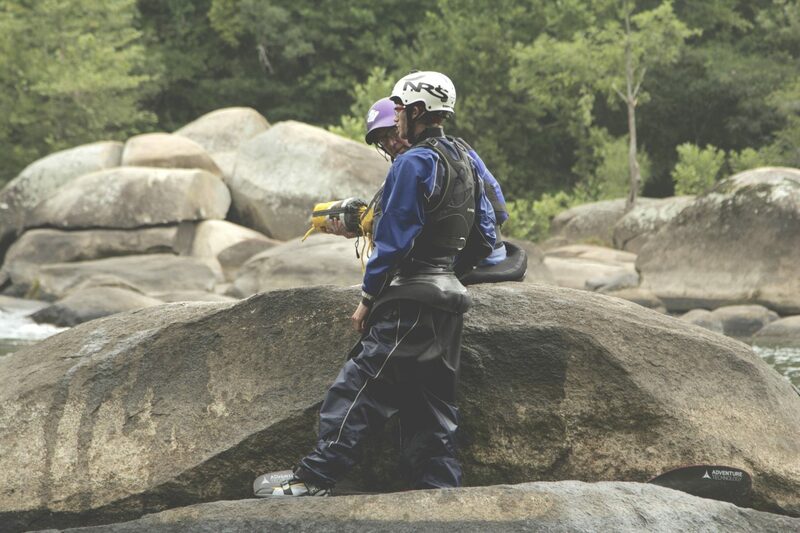 Join us for our Common Sense Swiftwater Rescue Course. Danger: an immovable object (the tree) meets an unstoppable force (the water), and you’re caught in the middle. Think of trees in the river as the colander you use to drain pasta in your kitchen: the colander hangs on to big things (the pasta) and allows little things (water, micro debris) to pass through. Trees in the river can act the same way, creating snag hazards for your body, boat, and gear as well as creating pinning environments where it can be very difficult to unpin or unsnag against the force of the water. Irregularly shaped rocks that are situated in such a way so as to allow water and debris to pass underneath the rock to a certain point but not escape. Generally most hazardous when undercut on the upstream side of a rock and can often be identified by the lack of pillowing of water on the upstream side, indicating lack of visible obstruction and passage to a point beyond visibility. Common on old rivers. Danger: think of undercut rocks like a fingernail: there is an extension or overhang of a rock higher up and a setback of rock down below. This is especially problematic when seen on the upstream side of rocks as the force of water can push objects into the subset part of the rock- often at or below water’s surface- and not allow release. Undercuts can also, for the same reason, collect debris like wood to further complicate the hazard. Undercuts can come in varying degrees such as more of a ‘catcher’s mitt,’ a less pronounced but still undesirable rock formation that likes to catch on the upstream side, or overhanging, where the undercut may be more parallel to the flow of the current but force may still push paddlers or debris down. It’s worth noting that single rocks and entire rock walls/river banks can be undercut, and often feature strength in downward force of water in addition to surface forces. Similar to the problems posed by strainers, sieves/siphons are collections of rocks or hard debris that form a pile and allow some water to pass through, but not larger objects. There is suction at surface and subsurface levels with these hazards as water continues to pass through, but the spaces formed by the rock piles are not large enough to allow passage through by a paddler, and these sieves/siphons can also collect wood and other debris. As with undercuts, sieves/siphons can often be identified by the tell-tale lack of pillow on the upstream side, indicating a passage of water as opposed to deflection. Common on rivers prone to changes in geology through rocks falling into the river or shifting with high water events as well as rivers with old geology. Danger: just like your pasta colander, sieves/siphons will pull downstream or underwater (or both) but not allow larger objects to pass through. 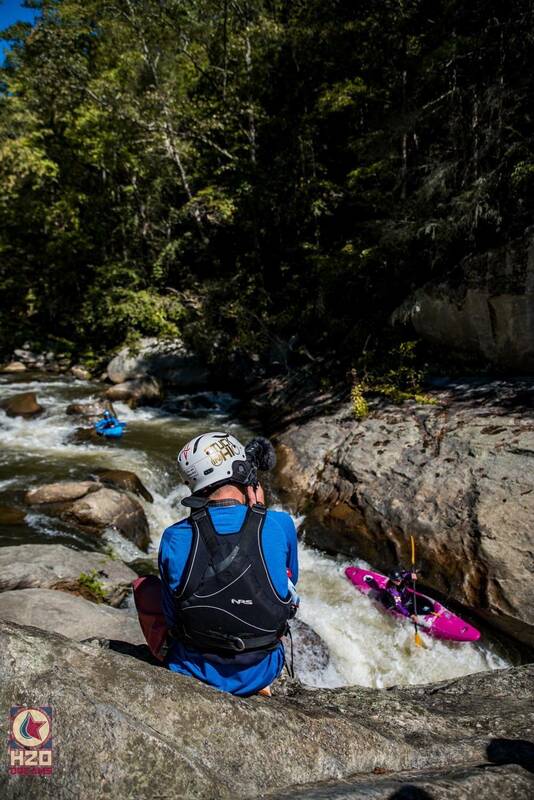 These rock formations can also create nasty pin potential where kayaks or paddlers can become entrapped while fighting the force of the water that pulls downstream. Potholes are circular formations in rock that wear downward over time, where there is an absence of rock, water attempts to travel. Potholes can feature an exodus where rock has worn all the way through and a tunnel or channel of sorts has been formed or they can simply be deep holes with no exit. Common on old rivers. Danger: reminiscent of potholes on our streets and roads, there will be current pulling downward in these areas, creating all sorts of pin and entrapment problems for boats and people. As with many of our other river hazards, potholes can also collect debris making downstream exit impossible. Areas where rock has been worn away over time and create a bowled-out effect; caves are common behind and/or at the bottom of drops and waterfalls on either side. Danger: forces at play can make an escape from caves- which can be both surface and subsurface- difficult if not impossible before fatigue sets in or becoming perilous at high water with impossible access both in or out of the cave. Uniform, usually man-made features which vary in height and style; human manipulation of rivers for diversion or retention should be approached with the utmost seriousness as these features are often extremely powerful and include perilous components like grates and gates, power turbines, and diversion spillways and penstocks. Large, power-generating dams are often well-known to river users and either not accessible to watercraft or illegal to descend, but low-head dams are quite common and feature a river-wide, uniform obstruction that allows water to pass over. Danger: the seriousness of large dams notwithstanding, low-head dams are fairly common on smaller streams and watersheds and appear to be passable to the naked eye. The problem with uniform features such as low head dams is that the features form so perfectly that very little water is exiting in outflow downstream, forming a terminal hydraulic. Boil lines can be tens of feet downstream from these dams, making escape next to impossible and resulting in subsequent drowning. These features are better to be portaged as even shore safety are often not able to rescue paddlers given the wide, spanning nature of low-head dams and the incredible force of the water here. These features can often be spotted by identifying horizon lines and/or the presence of irrigation and agricultural infrastructure. It should also be noted that while low-head dams are usually man-made, these same features and characteristics can present naturally as well. While hydraulics are common river features that do not have to be hazardous, weir holes/terminal hydraulics are inherently dangerous. What makes low-head dams and natural features with these characteristics so serious is that the uniformity creates minimal exit of outflow downstream, essentially becoming a non-stop loop of recirculation out and back in, with little chance of natural flush. These hydraulics can exist to varying degrees of ‘stickiness’ (read: the ‘stickier’ a hole, the more likely the chance for recirculation in and out of the boat). 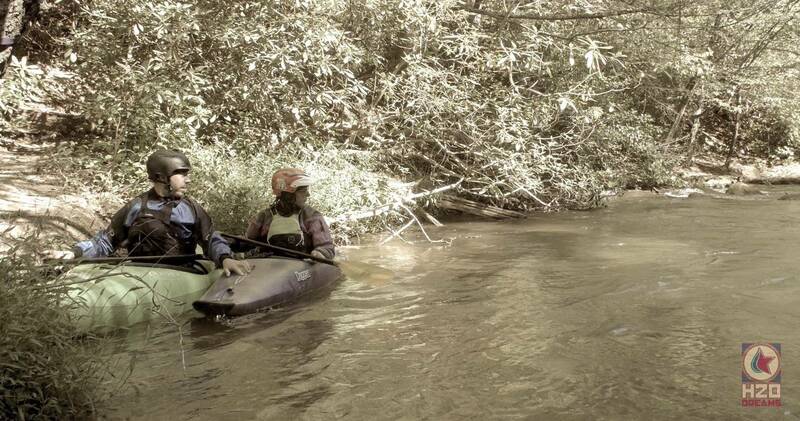 Can be seen on rivers with geology prone to ledges, pourovers, or waterfalls at higher flows. It is important to note, these hydraulics often look the most benign as the backflow is not dynamic in nature. Danger: Flush drowning is likely here; low-head dams or naturally occurring weir holes and terminal hydraulics form in such a way so that it is unlikely a paddler would be surfed or flushed out. High volume runs are not inherently dangerous but should be taken seriously nonetheless as surfs and swims can be prolonged due to the speed and force of water. Such rivers may include runs that are historically characterized by higher volume and big water features or even rivers at the high end of runnable flows. Danger: Flush drowning (prolonged exposure to forceful currents and irregular opportunities to breathe) is possible on high volume rivers where the ability to recover a swimmer (and his/her equipment) is stifled by the sheer speed and force of water. Alcohol, recreational drugs, and prescription drugs that lead to impairment. Additionally, even prescription drugs can lead to impairment with the addition of heat, sun, dehydration and/or other substances. Danger: Recreational and prescription drugs and alcohol can impair judgment, motor skills, and cognition. Individuals under the influence of drugs or alcohol can become liabilities to themselves and others, either causing safety issues due to impairment or not being able to participate in safety and rescue as a result. Paddlers taking prescription drugs that may cause side effects should consider disclosing this information to group members. Sections of river that are far from civilization, vehicle/emergency access, cell service, and/or possess more intense characteristics of wilderness such as unpredictable or challenging weather, wildlife, or terrain. Many wilderness medical training organizations describe wilderness/remoteness as 1-2 or more hours from definitive care. Danger: The exposure/remoteness of a section of river is often an underestimated component when assessing risk; even milder sections of Class II-III whitewater can create serious complications and threats when that stretch is remote. 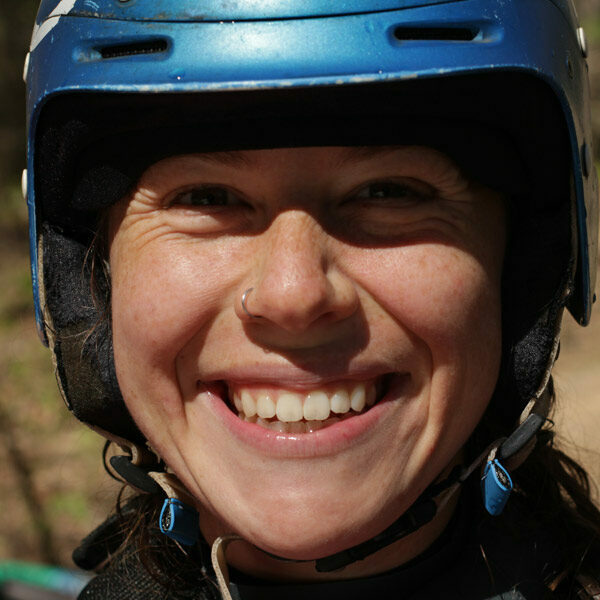 Consider that in the event of even simple injury like a dislocated shoulder or mild hypothermia, exposure of a long, remote run- even the easiest of whitewater- can quickly compound in to greater challenges when hiking out of the river, getting back to vehicles, or calling for support may mean hours or even an overnight stay before help can arrive. 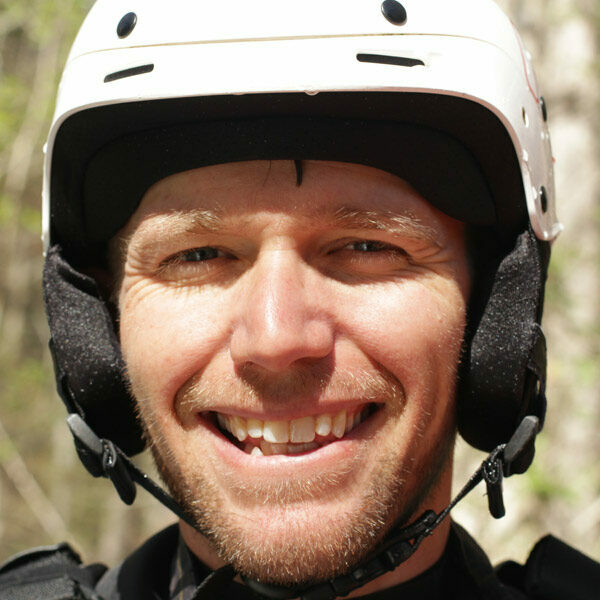 Head injuries, lacerations, breaks or dislocations, and hypothermia can go from being manageable on a stretch of river close to road and not far from medical support to perilous on stretches that put you hours away from definitive care or even cell service. In these instances, every possible precaution should be taken to avoid the compounding of simple adversity, such as, engaging in additional medical training like Wilderness First Aid/First Responder/EMT, etc; carrying supplemental equipment and repair kits like breakdown paddles, duct tape, screwdrivers, bituthene, space blankets, and even overnight readiness gear in areas where an overnight stay is a possibility; familiarizing yourself with local search and rescue, all possible access points, and closest medical/emergency care. Subsurface obstacles like rocks, wood, rebar, metal, or other trash can cause pitons, pins, or entrapment hazards or even boat or bodily harm especially from rebar or metal left in the river. Entrapment refers first, more generally to any hard obstacle that can hold a boat or paddler in place against will ie: trees, rocks, man-made material, etc. 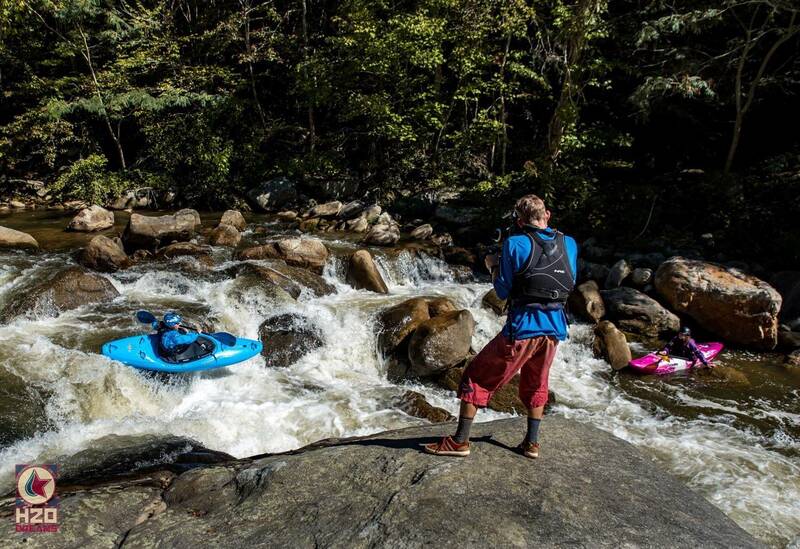 More specifically, paddlers may be familiar with the common adage of ‘don’t stand up in the river!’ to help avoid the entrapment of a foot in rocks or other subsurface snag hazards, although other limbs can become entrapped as well. Pitons are significant impacts to the bow or stern to a hard object, often resulting in dents, compressions, or even cracks or full breaks in the boat and can lead to fractures in the feet, ankles, legs, and backs due to impact. Piton potential can often- but not always- be identified by unusual spray or fanning of water. Pins are stable ‘stuck’ positions in the boat that can be vertical (bow or stern pinned down), flat (to the river bottom), side (single point of contact, usually central) or broach (two points of contact: bow and stern). Danger: Pitons can often lead to pins as momentum is stopped from the hit and can allow the flow of water to overpower the original trajectory of the boat. At the very least, pitons can spell whiplash or a broken boat and at their worst, broken bones. Pins, by nature, do not have to be disastrous so long as the paddler is heads up and breathing, as a pin, by definition, means stability. However, stability can change either by natural shifts in the pin or by the paddler shifting themselves to try and unpin, which can quickly change a head’s up situation to a head’s down situation in the blink of an eye. Head’s down pins are obviously extremely serious because the environment dictates enough force of water to create the pin in the first place, making access potentially difficult and extraction of the paddler just as hard. Lastly, submerged material like rebar and metal can easily tear through a kayak or raft and be disastrous for a swimmer, and other submerged obstacles like wood, hoses, etc. 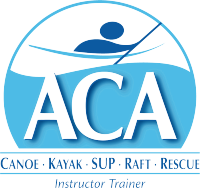 can create entrapments in or out of the boat. Bridge supports in water; can be concrete, metal, wood, or combination. Pilings can be columnal, triangular, or square, and can work linear across the river, in a line downstream, be offset, or a combination. Danger: Pilings can be pinning hazards both for people, craft, and debris. Most often, pilings are problematic after high water events where debris has collected against the pilings causing snag/entrapment/undercut hazards and, in extreme cases, even threatening the structural integrity of the bridge itself. Pilings should not be unilaterally feared, though, as there are often usable eddies behind the pilings and can often create fun and strategic river features. Rivers in the act of rising due to heavy rains, unexpected dam releases/breaches, etc. Such rivers should be approached with a supreme knowledge of watershed behavior as rapidly rising waters can change the entire nature of the river often forming terminal hydraulics, debris entrapment, and flush drowning. Danger: Rivers at ‘flood stage’ often offer strange, unpredictable river features like boils or fluctuating hydraulics, large wood and debris moving downstream in the flow, pollutants, and fast-moving, changing water. Flashing is the term we use to describe a river on quickly on the rise, with the implication that flows can go from normal to un-boatable in a matter of minutes. 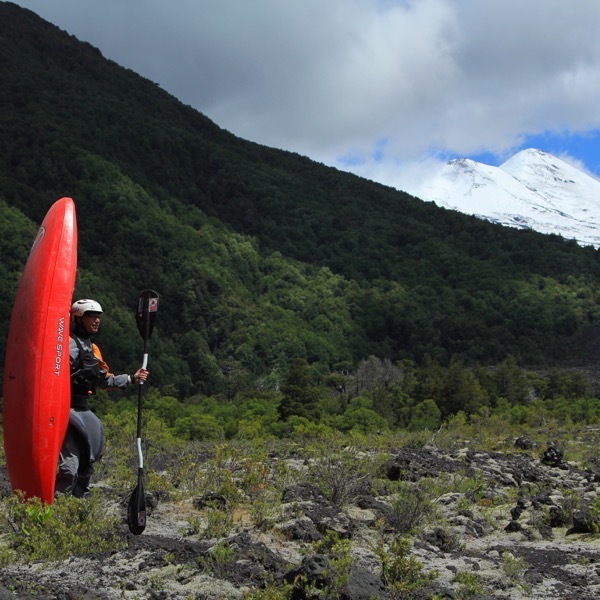 Paddlers should get to know their watersheds to know which rivers are prone to flashing (usually smaller streams close to headwaters) and which take more time to come up even after heavy rains. Furthermore, changes in water quality and color, as well as the shape and size of debris (small sticks vs limbs vs large trees) can be good indicators that a river is on the rise. A familiarity with the river and its nature at rising or high flows will help you make smart decisions about whether or not you can safely continue to boat downstream or if you need to get out and hike it home. Hyperthermia (dehydration, hyponatremia, heat exhaustion, heat stroke), hypothermia (mild, moderate, severe), and cold shock. Hyperthermia and hypothermia can both be heavily mitigated through adequate hydration and nutrition in the DAYS (not just hours or minutes) leading up to exertion as well as appropriate layering (evaporative cooling layers in advanced heat situations, insulating/dry layering in advanced cold situations). Also, remember that just because the air temperatures are warm does not mean that hypothermia cannot set in if water temps are cool enough or exposure is prolonged. For many years, our industry has suggested that when air temps combined with water temps are less than 120 degrees, special equipment is recommended; many industry members now believe this is a generous rule and that special equipment should be used more liberally to protect against hypothermia. Danger: Hypothermia is when the body loses heat faster than it can produce it, eventually causing body temperature to drop dangerously below normal levels. This can present mildly at first with mild shivering and confusion before progression to moderate stages that includes more violent shivering, loss of color, diminishing motor skills evidence through slurring or stumbling and eventually severe hypothermia in which the individual further loses motor capacities, memory, and speech and also begins to see radical dips in heart rate, respiration, and blood pressure. Similarly, paddlers should be aware of the potential for cold shock in cold-water environments, even when air temperatures are favorable. Cold shock is the body’s involuntary response to cold water that can include gasping and hyperventilation in response to cold water immersion, which can result in water in the lungs and drowning or dry drowning. Similarly- though somewhat less common- is the response of laryngospasm during cold shock where the individual’s larynx seizes, still threatening the ability to breathe and resulting in loss of airway and consciousness. Lastly, hyperthermia refers to heat-related illnesses, perhaps less common in the whitewater world but still important to be aware of in hot areas with sections of river that warm throughout the season. Be mindful of heat exhaustion (heavy sweating, cool skin, dizziness, cramping, fatigue) and the more serious heatstroke (heating of body temperature evidenced through lack of sweat, hot skin, dizziness, nausea/vomiting) and even hyponatremia (overhydration with too little sodium resulting in nausea/vomiting, headaches, confusion, drowsiness, and even seizure). Read more about cold weather paddling here. People in your group or another group who become hostile, defiant, reckless, or withdrawn. This behavior may be exemplified in refusals to participate in group safety, reckless behavior in line choices or substance abuse, withdrawal from group, or open hostility. 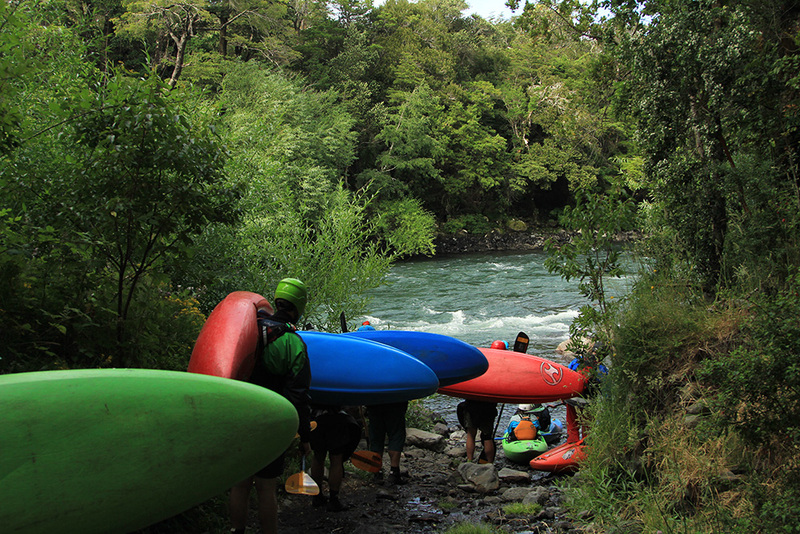 Individuals may choose to paddle off on their own, away from the group, become aggressive or violent with other river users, other otherwise engage in outlying behavior that is risky to themselves and others. Other groups, too, not exhibiting due diligence or safe and responsible use of the river can also become hazardous to you and yours when safety situations arise as a result of such negligent behavior. Danger: Individuals that go rogue or other groups that are not using good judgment can pose problems for everyone involved. Remember that your rescue priorities (that means preventative rescue, too) go YOURSELF-YOUR GROUP- OTHER GROUPS-BYSTANDERS- and, lastly, THE SUBJECT IN QUESTION (that can be a ‘victim,’ ‘swimmer,’ or person engaging in hazardous or threatening behavior). That means that when an individual in your group decides to break from the group’s chosen mode for moving downstream, the wellbeing of the group begins to be challenged by compromising energy, resources, daylight, etc. Rogue members of your own group (or someone else’s) may bring in to question the liability of group leaders should the person decide to break rank and head off on his/her own. Furthermore, those who become unstable on the river may turn on group members by becoming aggressive or even hostile and violent. 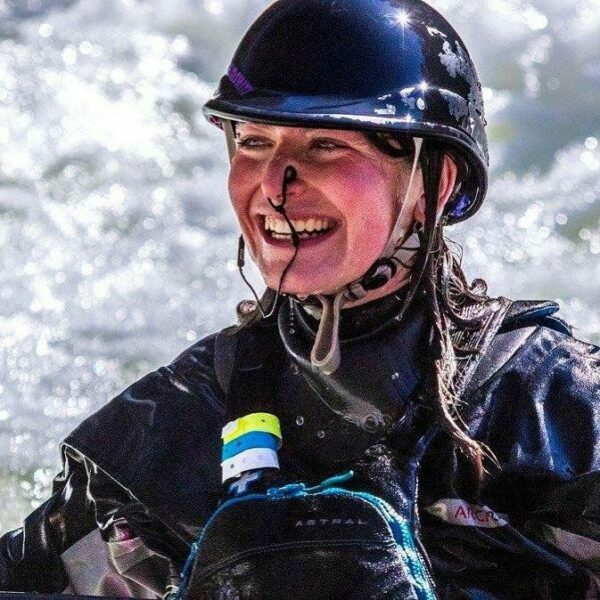 This can be best mitigated by carefully vetting group members well in advanced of paddling trips, clearly stating expectations and goals for the day, and exercising clear and decisive communication throughout the paddling experience. Other groups cannot always be mitigated, but the priority should always be put- first and foremost- on the safety and wellbeing of your own group first before engaging with another group. 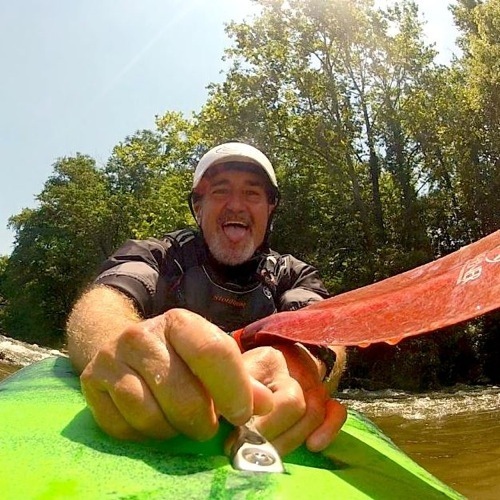 The degree to which you decide to engage another group on the river that seems in over their heads, negligent, or reckless is a personal, case-by-case decision that should be made with your own group’s input and their safety in mind. Improper equipment that is unsuitable for the desired environment or creates distractions, gets used indiscriminately, or left in the river can be just as hazardous as not having the proper equipment in the first place and our normal river hazards themselves. 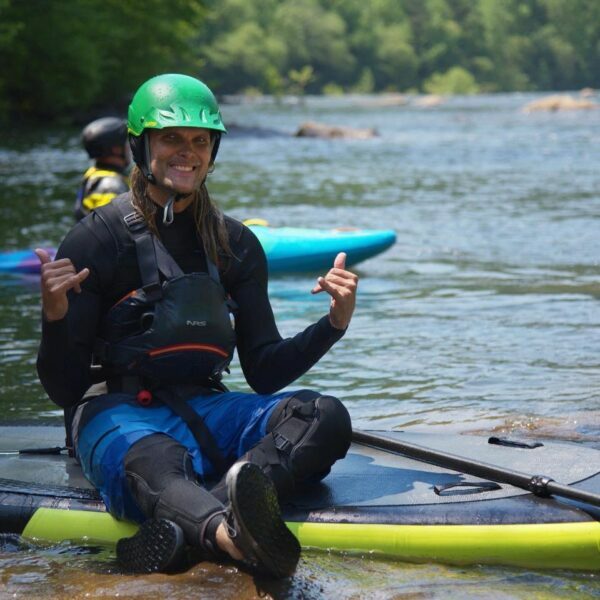 Pinned watercraft, boats without floatation, improper layering, gratuitous rope throwing, and ropes or boats left in the water can create perilous situations for paddlers. Danger: Gear left in the river is extremely dangerous and can create entrapment hazards for other users; this applies to both watercraft and rescue equipment like ropes. If you cannot extract it in the moment, communities should be made aware of its presence until it can be safely removed. Similarly, indiscriminate use of ropes can be just as dangerous as not having a rope at all by creating snags and entrapments in turbulent hydraulics or unnecessary situations. 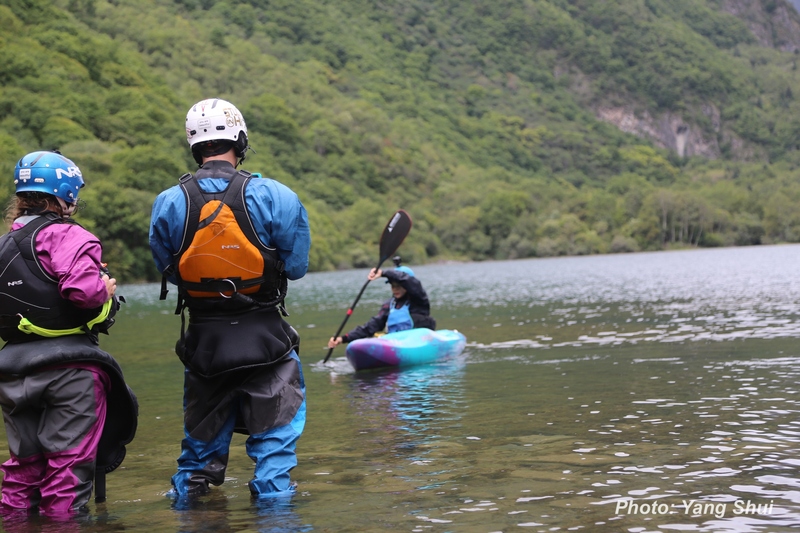 Lastly, gear that is unsuitable (like recreational kayaks in complicated whitewater or cotton layers), misused (ill-fitting helmets or PFDs), or distracting can compound simple occurrences like swims and turn those situations into maim or fatality. Occasionally and depending on environment, man-made waste like cars, hoses, rebar, fishing hooks, chemicals, and countless other items wind up in our rivers and streams. Danger: All of this waste can present hazards to us in the form of entrapments, snags, lacerations, or even gear damage. Pay particular attention in areas with high development or after high-water events. Additionally, rivers in urban areas are prone to experiencing combined sewage overflow during heavy rain events, with waste working its way into streams or rivers and causing potential for illness.